You know your diet has a lot to do with your weight and body composition. When it comes to weight loss, and maintaining that weight loss, the number one strategy people use is modifying food intake. Most people emphasize their food choices, and that’s definitely encouraged. Watching what you eat is important. But meal frequency is another dietary variable that often gets overlooked. Hand-in-hand is meal size. How do those qualities of your meals affect your weight? In athletics, research has established timing and quantities for food intake that maximize performance. But people just trying to shed a few pounds are often less sure of how to optimize their meals for weight loss. Over 50 years ago, research suggested that eating frequent, smaller meals was associated with lower weight and better metabolic health. More recently though, that notion has been under substantial speculation lately.. So which is better for weight loss? Frequent, smaller meals throughout the day? Or just a couple larger meals at regular times during the day? Before figuring out how to optimize your meals for weight loss, let’s first take a look at some background knowledge on how your body handles meals, and why their frequency and size matters. Meal digestion is a complicated process. Luckily, for this article you just need to focus on a few basics to understand why the frequency and size of your meals can impact your weight. Each time you eat a meal, your metabolic rate increases. That’s because all the processes for digestion and absorption require energy and blood flow. On average, your metabolic rate increases by 25% after a meal. Of course, that number varies with factors like hormone levels, circadian rhythm, and weight fluctuation. But a substantial contributor to variation in the thermic effect of food is the size of the meal. Larger meals require more energy to power digestion, so they increase metabolic rate more than smaller meals. When a meal hits your stomach and intestines, it triggers your digestive tract to release hormones that affect satiety. Collectively they’re called gut hormones, but each one has specific actions and effects (examples include PYY, GLP-1, and GIP). Gut hormones matter because they signal your body to slow down or stop eating. It’s no surprise, then, that the size of a meal influences the quantity of gut hormones that are released. Your body releases greater quantities of gut hormones in response to meals with greater caloric density. Since larger meals tend to contain more calories, this is one reason you feel more satiated after larger meals. Smaller meals are less satiating, meaning you’re likely to want to eat sooner after that meal. The period after a meal during digestion and absorption is known as the postprandial state. That’s important to understand because your body is in ‘storage mode’ in the postprandial state. Even though your metabolic rate increases after a meal, the contents of that meal still get broken down and, for the most part, stored. About four hours after a meal, your body is back to its baseline ‘fasted’ state, during which it primarily burns through your stores. By eating frequent, smaller meals throughout the day, you spend a greater portion of the day in a postprandial ‘storage’ state, despite a slightly elevated metabolic rate. As we noted above, you also don’t give your body the chance to release a larger quantity of satiating gut hormones, so you may feel hungry throughout the day. Keep these points in mind as you read on about how using meal frequency and size as part of your weight loss strategy. Remember the 1960’s study that showed frequent, smaller meals were better for maintaining a lower weight? It’s time to dispel that common belief. When people try losing weight on a low calorie diet, they often think that spreading their calories throughout the day will keep their appetite down and make it easier to stick to the diet. That’s not necessarily true. Preliminary research shows that high eating frequency (8x / day) results in more hunger and desire to eat, and less fullness than low eating frequency (3x / day). Why? The study wasn’t designed to find out. But it may have had something to do with the differences in how larger and smaller quantities of food are digested and their effects on gut hormones and satiety.. In any case, that study is only one piece of the puzzle. Appetite matters, but the result we’re after is improved body composition. In a two month trial, eating one meal per day resulted in a greater loss of fat mass than eating 3 meals per day. While the actual number of meals per day in this study was different than others you’ve read about, this result shows that eating fewer meals per day can help you achieve a better body composition, especially in the short-term. Epidemiological research on meal frequency shows that more frequent eating is associated with higher weight. Since epidemiological data is usually observational and collected on large groups, it’s not always useful for explaining why things happen. But, it’s a great way to get an idea of what works in general and what doesn’t. In a study of almost 20,000 people, researchers found that men and women were about 1.5 times as likely to be overweight or obese if they ate five or more times per day (compared to three or fewer times). While that doesn’t explain why more frequent eating was associated with higher weight, it’s important to note that this was true even for people whose eating occasions were classified as ‘snacks.’ The high frequency eaters weren’t all wolfing down five full meals a day. The evidence from this type of research becomes a bit stronger when participants are followed over time. That way, it’s possible to observe changes, rather than simple associations at a snapshot in time. In a study that followed thousands of men over a decade, researchers found that those who ate more than 3 meals per day were about 15% more likely to gain 11 pounds over the decade. It’s tough (or impossible) to tell from these studies whether eating fewer meals will directly lead to weight loss or lowering chances of weight gain, but you can conclude that people who eat less frequently tend to keep extra weight off. Clinical studies are helpful for figuring out whether you should actually follow a strategy. Keep reading to find out how meal frequency affects your appetite and body composition. So, why is it that lower meal frequency seems to be better for weight and fat loss than eating throughout the day? The answer has to do with the physiology of your meal intake. 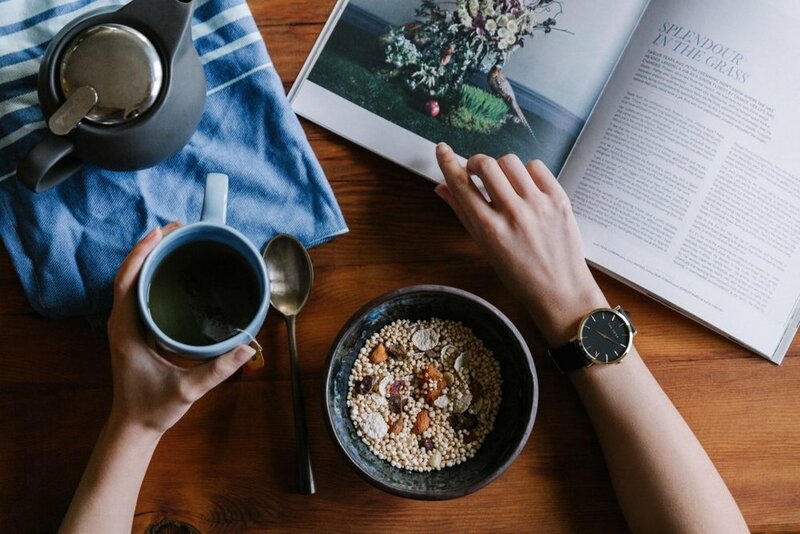 In another study that found eating twice (rather than six times) per day is better for weight loss, the gut hormone response to lower meal frequency meant subjects were more likely to eat breakfast. More on that soon, but for now just know that eating breakfast may help you achieve weight and fat loss. Research also shows that fewer eating occasions throughout the day results in greater production of one of the key hormones that increases satiety after a meal, PYY. Higher protein intake was also associated with greater satiety. That means it should be easier to stick with a low calorie diet if you eat your allotted calories in just a few meals per day. Make sure to get your protein requirement in too! Lower meal frequency isn’t the only strategy you should consider to aid your body composition goal. You can combine meal frequency with other habits to boost your chances even more. Many people swear by eating breakfast as a key strategy for losing and maintaining weight loss. But what does the science say? In people who have some weight to lose, and especially those individuals who don’t normally eat breakfast, starting the day off with a healthy meal can help you lose weight. Making breakfast a high protein meal could also contribute to lowering your fat mass. But the common theme these studies share is that getting your calories earlier in the day is best for fat loss. Compared to meal frequency and distribution strategies, calorie restriction and fasting are more traditional ways of losing weight and fat. These are important strategies to be aware of, especially because calorie restriction can be combined with meal frequency. While calorie restriction (CR) is self-descriptive, intermittent fasting (IF) and alternate day fasting (ADF) aren’t as well known. IF involves going for long stretches of the day (and night) without eating, and getting all your daily calories in a shorter time-frame. ADF involves alternating days of eating normally, and not eating at all. So which strategy is right for you? To start with, CR will help you lose weight and fat in almost all cases since it induces and energy deficit. It’s also more effective than IF, although IF still results in weight loss and may just be more difficult to stick with. ADF results in the same amount of weight loss as CR, so you could try either strategy. Just keep in mind that sticking with ADF in the long-term may be difficult, since you’re likely to be hungry on fasting days. If you’re trying to lose weight or fat, it can be appealing to go after strategies like fasting or adjusting meal frequency. But keep your eye on the prize, and recognize that the most important step you can take is a moderate reduction in calorie intake. To lose weight, you need to be in an energy deficit. No amount of adjusting your meal frequency can change that. Here’s some evidence to support that: on the same amount of energy deficit, research participants lost the same amount of weight and fat on a high meal frequency plan as a low frequency plan. That’s not to say meal frequency doesn’t matter; it does, as you’ve seen throughout this article. Under a low calorie diet, people eating two meals per day lost more weight than those eating six per day. But without an energy deficit, neither high or low frequency eating groups lose weight. As with any routine change or lifestyle intervention you try, there’s a possibility of unintended consequences with altering meal frequency to try to achieve your body composition goals. During normal conditions, protein contributes minimally to energy production. But after extended periods without eating when carbohydrate and fat stores have been broken down, protein is broken down in greater quantities to provide energy. That means one potential unintended consequence is muscle breakdown with strategies like IF and ADF. Even with reducing meal frequency, some research finds that two meals per day results in diminished lean body mass compared to six meals per day. On the other hand, in resistance trained men, a fasting strategies like IF may not cause a loss of muscle mass. The jury is still out as to whether fasting and reducing meal frequency impacts muscle mass. In the study on resistance trained men who did not lose muscle, they consumed substantial quantities of protein each day, potentially warding off and muscle mass loss. Regardless, it’s important to be aware that you could run into unintended consequences with any dietary changes you make. To avoid a situation like muscle loss, make sure to plan your dietary strategy thoroughly when making changes. Also, incorporate a regular strength training routine to preserve or maybe even gain muscle. Meals affect your physiology, and your diet has a major impact on your body composition. Altering your eating frequency can affect your ability to reach your body composition goals, since meals affect metabolic rate, gut hormones, and satiety. Lower eating frequency is associated with weight and fat loss. Energy deficit (calorie restriction) is critical to achieving weight and fat loss. Exercise regularly to keep up your metabolic rate, energy expenditure, and health and fitness while you lose weight. While eating two meals per day generally seems like the most effective strategy for weight and fat loss, it may not work for you. Make sure to mitigate unintended consequences by defining your goals and planning your dietary strategy before you get going. Define your goals clearly, write down how you plan to change your diet, and assess body composition on a regular schedule to find out if your plan is working. Remember that there’s no ‘magic pill’ solution to achieving your body composition goals. Only dedication and hard work will get you there. But if you’re looking for a bit of a leg up, consider maximizing your dietary strategies. Results too good not to share!